Early in my career, I recognized that without training in affirmative practice, mental health providers are at risk of causing harm to their transgender and gender non-conforming clients (TGNC). As a result, mistakes are frequently made by using outdated treatment strategies and having a lack of education of how to work with gender-diverse clients. Today, I know that providing affirmative care practices are critical to ensure the safety of your TGNC clients. I will give you an insider’s perspective and guide you step-by-step through navigating the challenges your clients face that are often overlooked by mainstream clinical approaches. Learn and differentiate correct terms such as gender queer, gender fluid and cisgender. Breakthrough strategies to help your client tell their partner, families, friends and employers. Gain tips to discuss hormone treatments and surgical procedures. Don’t wait to have your next TGNC client educate you about their challenges and clinical concerns! Begin your journey now to start providing a safe place for all your clients to genuinely be themselves. Communicate the complexities that transgender clients face daily including physical, mental, and social discomfort and how to address these in clinical practice. Develop a deep comprehension of the ways that a client’s own identity can create a trusting, effective relationship, and how their identity can negatively affect the clinical relationship. 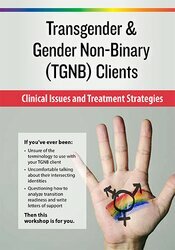 Apply concepts of affirmative clinical practice with gender diverse clients. Ascertain the various gender diverse identities and understand the ways that intersecting identities create further challenges in daily life. Assess your current clinical practice to determine how affirmative your practice is for gender diverse clients. Individualize and create a transition timeline and goals with your client. Prepare letters for clients seeking feminizing and masculinizing hormone therapy and gender confirmation surgeries. How does a clinician integrate this information into their practice? Financial: Susan Radzilowski has an employment relationship with Detroit Institute for Children. She is a faculty member at the University of Michigan; and Wayne State University. Ms. Radzilowski receives a speaking honorarium from PESI, Inc. Non-financial: Susan Radzilowski is a member of NASW – Michigan chapter; National Association of Social Workers; Michigan Association for Infant Mental Health; and World Professional Association for Transgender Health. Speaker is the parent of an adult who identifies as transgender.